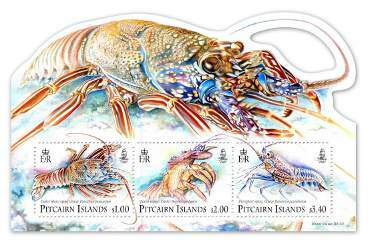 Lobsters in the Pitcairn Islands are difficult to catch, requiring a dedicated crew, handmade lobster pots and a great deal of skill. Three species are known to frequent this area and several searches located excellent specimens. The Easter Island spiny lobster Panulirus pascuensis, is native to the south eastern Pacific Ocean, round the coasts of Easter Island and Pitcairn Island and found at depths of up to 5 metres (16 ft). Like most lobsters it enjoys a rocky habitat and seeks out marine caves and crevices during the daytime. Adults grow to a total length of 15–25 cm. The colour of this spiny lobster is dark red – greenish - purple with pale transverse bands on the posterior edge of the abdominal segments. Panulirus pascuensis feeds at night and is an omnivore and scavenger. Its diet consists of slow moving prey such as molluscs, echinoderms, crustaceans and chitons, supplemented with fish carcasses. The Aesop slipper lobster Scyllarides haanii –this species is located on coral reefs and rocky bottoms with recorded depths ranging from 10 to 135 m. The Aesop also tends to hide during the day seeking rocks and crevices for protection and camouflage.This solitary species forages at night, feeding on a diet mainly consisting of bivalves. It inhabits the near coastal waters in winter to early spring (when water temperatures are at their lowest), and migrates to deeper waters in summer for breeding requirements This species grows to a maximum body length of 50cm, although it most commonly reaches between 16 and 30 cm. Pronghorn spiny lobster Panulirus penicillatus - this species has the widest distribution of any of the spiny lobsters. It occurs in the Indo-West Pacific and East Pacific regions. Predominately nocturnal, it commonly inhabits depths of 1 to 4 m on rocky substrates and is often found in the outer reef slopes, sub-tidal zone or surge channels. Averaging 30cm in length the Pronghorn has a greenish-reddish body colouring, however this can vary green through brown green to blue-black or dark reddish brown. 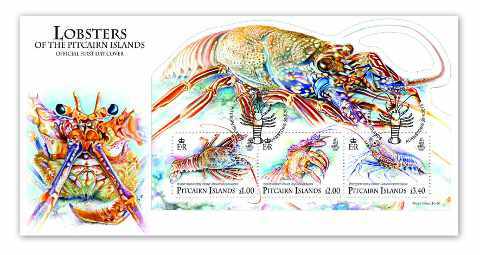 Acknowledgement: The Pitcairn Islands Philatelic Bureau acknowledges the valuable assistance of Kerry Young, Adamstown, Pitcairn Island.